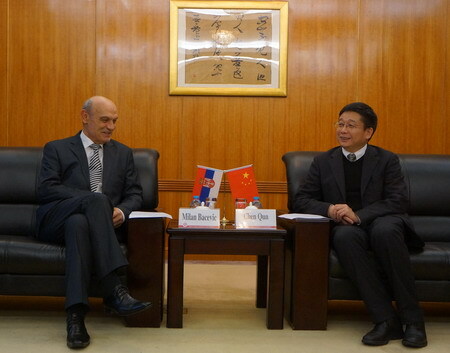 (Shanghai, 15 January 2015), Ambassador of the Republic of Serbia to the People's Republic of China M. Bačević paid a visit to Shanghai 14-15 January 2015. On that occasion, the Ambassador visited the Consulate General of the Republic of Serbia in Shanghai and had meetings with representatives of the Foreign Affairs Office of Shanghai, Shanghai Chamber of Commerce, East China Normal University and local companies. At the meetings, Ambassador Bačević presented the potentials for further improvement of the political, economic, trade, cultural, educational, inter-university and scientific and technological cooperation between Serbia and China.